If you’ve ever run out of coffee on a Monday morning, or lost sales from your coffee shop due shortage of coffee beans, you know how convenient a coffee subscription can be. It works just like any other subscription service – you choose your product (beans, blend, grind and size), your schedule (weekly or monthly) and have it delivered right to your doorstep. You get access to the best coffee beans to suit your taste as well. 1. Your coffee is delivered fresh and consistently. Buying ready-made coffee beans or grounds from the store may sometimes mean that the coffee has been sitting there for long. When coffee is roasted, it releases carbon dioxide and continues to do so for days afterward, also releasing flavour in the process. So while there are vacuum-sealed coffees available in the market, you get the freshest, best coffee beans with a subscription. At Newbeans, the coffee is roasted when you order and delivered anytime from 24-48 hours, depending on your desired schedule. 2. Your coffee is delivered to your doorstep. It’s just so easy to forget to buy coffee. It’s either you forget to grab grounds at the grocery, or decide that the ones available there just don’t cut it for you. Either way, you need to drive or walk down to the nearest café to get your fix. Coffee subscription changes that. Newbeans can deliver your chosen beans right to your home, office or business as frequently (or in frequently) as you need them. 3. You get good value. Apart from the obvious cost of driving or walking down the nearest café, your coffee subscription can also save you on the cost of coffee, cup per cup. Subscriptions usually come with a price-off on the retail price and even further markdowns on size upgrades. 4. You get to try a variety of coffees, especially rare kinds. Buying coffee from the grocery limits your exposure to commercial brands, but by buying straight from coffee roasters, you are exposed to many different kinds of coffee, including signature blends not found anywhere else. At Newbeans, we have almost a hundred blends and counting available. We also have on board some of the most respected coffee roasters in the world to choose only the best coffee beans and produce only the highest grade coffee. 5. You can customize your coffee. Coffee connoisseurs can be very particular about what they like in coffee. If you are confident in your coffee preferences, you can create a blend that’s uniquely yours! Newbeans has created CTAPS (Coffee Tasting and Profiling System), a unique tool to help individuals identify the perfect blend of coffee based on personal preference and key attributes of taste, aroma, body and acidity. 6. You get to learn more about coffee. Coffee roasters who sell coffee online usually have blogs, newsletters and updates on coffee. If you’re a true coffee lover, one of the benefits of following their presence online is getting new information on coffee and the coffee industry. To get updates from Newbeans, follow us on Facebook or subscribe to our newsletter. Ready to subscribe to the best coffee beans? Sign up for your coffee subscription here. 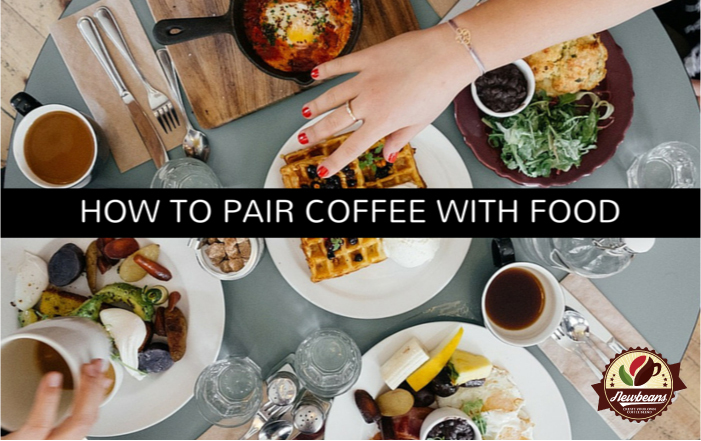 Food pairing is not just for wine connoisseurs, it’s also for coffee lovers. Choosing the right blend to go with your food will help you bring out the best flavours and aromas, creating a match made in sensory heaven. When trying to pair coffee with food, a good rule of thumb would be to match the intensity of the flavour of your dish. Heavier, more intensely flavoured foods are best matched with stronger coffees to match their richness. Kenyan or Rwandan coffees might work well here, just like coffees from New Guinea or Indonesia. Lighter foods are best paired with lighter, more nuanced coffees. Try balanced coffees from Central or South America or a floral, fragrant coffee from Ethiopia. Chinese or Asian dishes, with their often nutty and spicy flavors, go well with nutty and smokey coffees. Fruity and tarty desserts go well with bright coffees. While there may be a science to pairing flavors, the best combination is still the one that works for you. You may start with this list, but always follow your palate! Enjoy pairing your coffees with your favourite foods. Got any tips on how to pair coffee with food? Share it below or email us at sales@newbeans.co.uk. The Lecture Club, London’s longest running literary salon, will be having our CEO and Founder Mark Wilson MBA to speak on Disruptive Technology. For Disruptive Technology (or is it?) 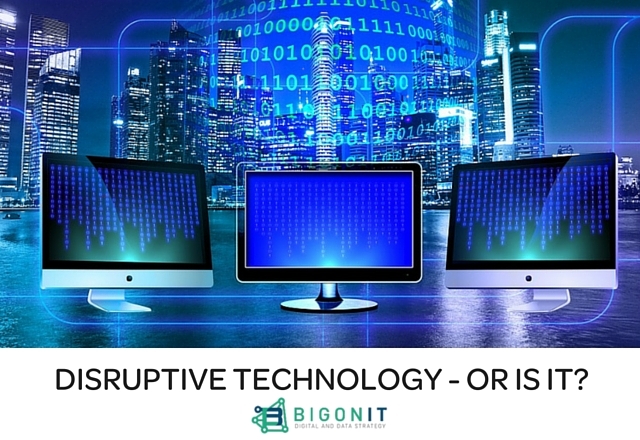 Mark discusses examples of how technology is providing more opportunities for companies, and how disruption of traditional models is becoming an every day occurrence. Mark Wilson has worked across many different industries, with a specialisation on the impact of Technology. He started off his career working for Japanese consumer electronics companies and property development. Since then, he has used technology in various industries and many unique applications – such as the development of Property Renting, Supply Chain, and Food Distribution. He is now also the founder of Newbeans Coffee, a pioneering online coffee roaster; and BigOnIT, a full service digital consultancy that offers strategic assistance to companies and management teams, who aim to better understand the use and development of technology. Book your tickets to the talk here. 10% of the proceeds of The Lecture Club blend available exclusively at the talk will go to The Alzheimer’s Society. The following post is part of a series that discusses the coffee industry landscape in a particular region of the world, and the opportunity for development of the Newbeans CTAPS (Coffee Tasting and Profiling System) there. Through this series, we explore the viability of creating and developing a global web-based, green bean purchasing ecosystem, like the Newbeans CTAPS. It was in the eve of the 1900s that Koreans were introduced to coffee. Then King Gojong was the first person to taste coffee in Korea, through Antoinette Sontag, the sister-in-law of a Russian ambassador, treated the king to a cup of coffee. Coffee was a beverage of wonder to Koreans, who were always curious about foreign cultures due largely to Korea’s homogenous culture. It was consumed as a symbol of westernization and modernization. In mid-1900, “dabangs” or coffee shops continued to exist as a meeting place rather than as a place where people could drink coffee; however, it was not the time for ordinary citizens to consume coffee yet due to the high price. Dabangs in general became more open to middle class citizens in 1960s; it became a popular dating place for young men and women. It provided a feeling of freedom to college students who could not express their political opinions openly in 1970s. In 1990s, people thought that consumption, too, had a style so preferred cafés with a neater interior design and professionalism in coffee. 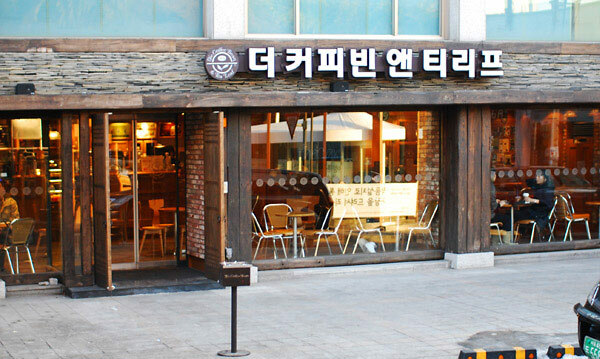 And then there was a huge shift in Korean café culture’s history in 1999 when Starbucks, the first foreign franchise coffee shop in Korea, was established in Sinchon, Seoul. Starbucks introduced Korea to a new café culture, such as take-out and self-service system without good-looking waitresses and staying at a café alone reading a book or doing homework. Since then, more foreign franchise coffee shops entered the market with a greater variety of coffee and atmospheres, and more local franchise cafés and small private-owned cafés appeared with their unique features. Today, alongside foreign franchises, South Korea has very distinct coffee shops: interesting in a sense that they focus primarily on providing certain thematic activities rather than just selling beverages and desserts, and also have very “cute” or “agijagi” characteristics. Examples include comic book cafés, puzzle cafés, and multi-room cafés that offer many activity items – such as TV, computer, board games, and Wii – in one room. On our following post, we explore what makes coffee the new drink of choice this side of Asia. Image courtesy of frshgrnd.com. 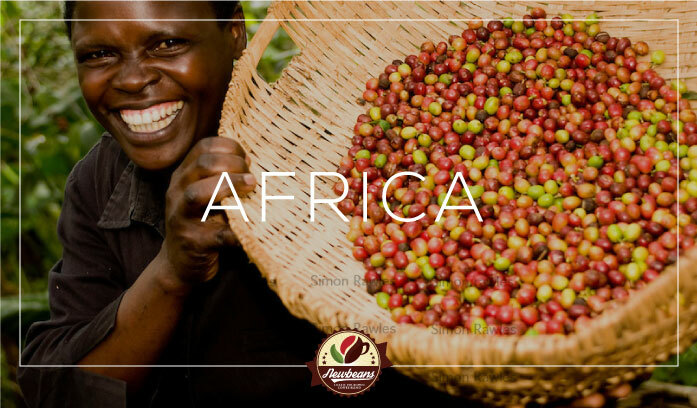 Africa is traditionally known as a coffee producing and exporting region, but the recent years have given consumption a boost as well. Several countries on the continent, which gave birth to the coffee bean now grown worldwide are experiencing booming domestic consumption and developing their own unique coffee culture. With the exception of a handful of countries, such as Ethiopia, coffee has historically been a cash crop in Africa and consumption has been low. In countries such as Kenya and Uganda, coffee has been dwarfed by a preference for tea, which has traditionally been much cheaper. INCREASING DEMAND: Coffee demand in Africa has risen about 20% in volume in the five years to 2014. CONSUMPTION STILL LOW: Despite the recent growth in coffee drinking, African consumption is still low compared with other countries. Ethiopians are drinking 2.5kg per person a year, Madagascar 1.28kg, and Ivory Coast 0.8kg, according to Ecobank. This compares to 6.2kg for Brazil. The ICO estimates that Italians drink about 5.8kg while Britons consume 2.8kg a year. PRODUCTION SLOWING DOWN: While consumption is growing, production is slowing down. Generally known for the fruity and complex flavours of its beans, the continent used to be a leading grower, with eight African countries in the world’s top 20 producers during 1965 to 1988, says the ICO. Since then, this has fallen to four. ETHIOPIA / UGANDAN BEANS STILL KING: Apart from Ethiopia and Uganda, coffee production on the continent has slumped, although it still produces some of the world’s finest coffee, with beans from some plantations commanding rich premiums. NEW FLAVOURS INTRODUCED: A growing trend worldwide is some roasters are turning to Africa for new flavours. After four years of working with farmers in South Sudan, Nespresso, the premium coffee arm of the Swiss consumer group, this month launched a new coffee from the beans from the country’s first ever exports.On the next part of our Coffee Around the World Series, we tackle the thriving coffee culture in Asian countries. There are more credit card holders, but COD is still strong. In the UAE, 60% of the 3.65 million e-commerce customers are located in Dubai, while another 27% are in Sharjah and Abu Dhabi collectively. In Egypt, 27% of e-commerce purchases are paid for with a credit card, while cash on delivery makes up the remainder. Online basket size is growing in the Arab peninsula. Saudi Arabia saw an overall increase in e-commerce basket size. There was an increase of 8% for cash-on-delivery orders in the last year, increasing from $143 in 2013 to $154 in 2014. Credit card orders then saw a 32% increase in the last year, increasing from $96 in 2013 to $127 in 2014. Egypt saw the largest increase in e-commerce basket size. There was an increase of 16% cash-on-delivery orders in the last year, increasing from $83 in 2013 to $96 in 2014. Credit card orders then saw a 36% increase in the last year, increasing from $71 in 2013 to $96 in 2014. Arabs use mobile commerce twice as frequent as the rest of the world. People in the Arab World transact on mobiles more than the global average. 41% of smartphone users in the Arab World transact online, while only 21.3% of global smartphone users transact online. 18 to 26 year olds make up the largest demographic group of mobile payment users with 39% of the market. This age group is expected to reach $2.45 trillion in transactions worldwide by 2015. The next largest group is the 27 to 39 year olds with 31% of the market, followed by 40 to 61 year olds with 26%, and 62 and older with 3% of the market. All these indicate that there is a large opportunity for online coffee roasting in Arab countries, particularly Dubai and Saudi Arabia. Not only are young consumers driving coffee consumption, they are also the leading users of e-commerce in the region, proving that online coffee ecosystems have a chance to flourish in the market. It should be emphasized that young consumers specifically look for premium coffee experience coupled with convenience, both aspects that Newbeans CTAPS system can provide. Of importance will be the provision of COD options and mobile-responsive e-commerce pages given the habits stated above. In Saudi Arabia, El Farouki Coffee Center led coffee in 2014 with a 15% value share. The company had a strong following among consumers of traditional coffee such as Arabic and Turkish coffee. 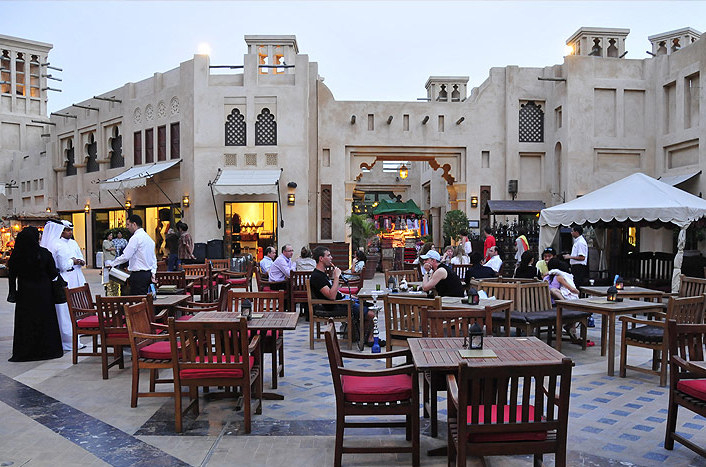 In the United Arab Emirates, Nestlé Middle East FZE maintained its leading position within coffee in 2014, with a retail value share of 26%. The company managed to create a modern image, while benefiting from strong brand equity. In Morocco, Nestlé Maroc SA leads sales of coffee in Morocco in 2014 with a 29% value share. The company is marketing one of the most popular coffee brands in Morocco under the name of Nescafé. While traditional-style coffee and instant coffee are still lording it over in these major parts of the Middle East, young consumers are also waking up to specialty coffee. Given specialty coffee’s popularity in the West, the trend is already catching up in major cities in the Middle East – led by Dubai. The entry of independent roasters serving fresh coffee has influenced early adopters, and more cafes are beginning to serve better-prepared coffee. What is peculiar about Middle East however, must be pointed out, as it determines the beans that will sell. Whereas in other markets, taste, aroma, acidity and roast determine the offtake of beans, in opulent Saudi Arabia and Dubai, size and relation to tradition seem to play importance. In some cases, the origin matters as well, as in the case of East Harari Coffee. “The biggest importer of East Harari Coffee is Saudi Arabia, because Harar is one of the holiest sites in Islam,” explains Wade. The changing taste and increasing interest in specialty coffee does not mean traditional coffee customs are about to perish. In fact, it’s quite the contrary. The Middle East seems to be developing a coffee culture all their own – one where traditional and artisanal coffee coincide. The growing interest of the young consumers and the openness of traditional Arab consumers to Western way of life, coupled with increasing Internet and social media penetration, provide a sound business environment for online coffee roasting in the region. 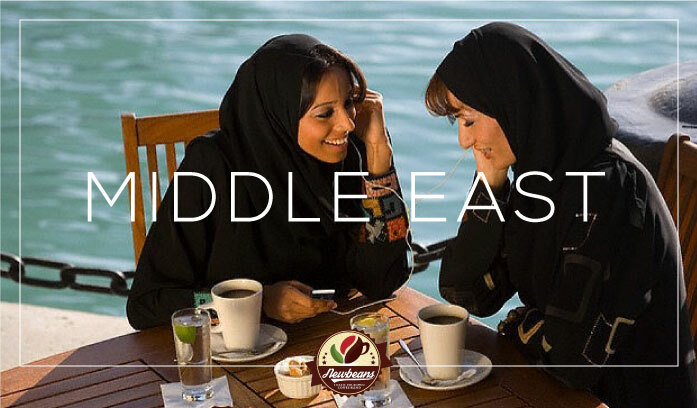 As seen above, Arab consumers are seeking coffee experiences and products similar to those found in European-style cafes and North American coffee shops, but with the option to enjoy or combine with their traditional coffee preferences. The “modern” coffee experience combined with using origin beans, adding spices, and the chance to enjoy them in the traditional coffee house are what make up the unique coffee preferences of the market. All these call for a coffee roasting company that will be able to adapt and meet these distinctive needs. 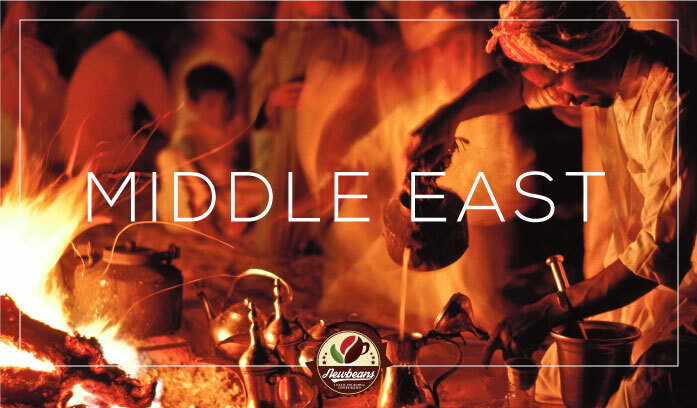 The Arab consumer’s need for both convenience and coffee products specialized to meet their unique palate is a gap that Newbeans CTAPS ecosystem can fill. On the next part of our Coffee Around the World Series, we tackle the thriving coffee culture in Asian countries. Saudi Arabia, one of the most tradition-bound nations in the world, is experiencing big changes. The changes appear to be largely the work of their fairly young prince, the 30-something Prince Mohammed bin Salman. Prince Mohammed took over as deputy to his father King Salman, and has titles that put him in control of the army, the oil industry and most other areas of the economy. The prince is representative of the nearly 70% of the population that is under 30, and his recent decisions have been a departure from how the country is used to being run. While the older generation express concern about the “rashness” of his decisions, the Prince has in general been gaining praise for these moves. These seem to bode well if Saudi Arabia’s openness to change is concerned, and it reflects largely on the habits of the youth in the country. 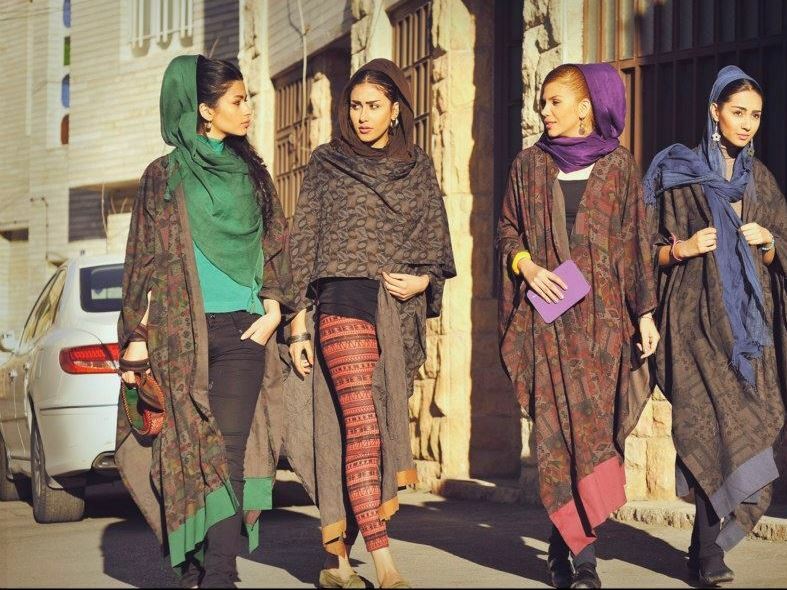 Young Saudis are rapidly adopting a Western way of life. Increasing internet penetration and exposure to social networking sites such as Twitter, Facebook and Instagram has exposed them to different international lifestyles, and this also reflects on their dietary habits. As the strong desire to emulate Western ways develop, this trend permeates their daily lives, including how they dress, groom themselves and even what they eat and drink. The number of American-style diners and European-style cafes are on the rise, and this is where they socialize in groups. This might very well can be considered the youth’s version of the “coffee houses” of yesteryears. Consequently, the young population is also consuming more coffee, despite tea being the national favorite. And in certain areas of the region, the place where consumers purchase their daily cup, and the type of coffee they are drinking, is changing. The recent years, however, saw the increasing variety of coffee becoming available in restaurants, cafés as well as retail outlets and they are more similar to the coffees consumed in Italy or the USA. 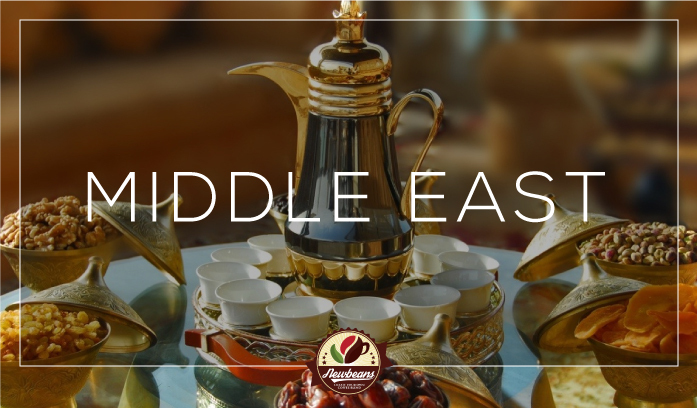 And while fresh coffee is the format used to brew traditional Arabic coffee, instant coffee is the most preferred category by young consumers in Saudi, due to its convenience and variety of flavour options. In particular, young consumers are drawn to instant coffee mixes like 3-in-1’s and instant Specialty Italian coffees that aim to emulate coffee drinks like cappuccinos and lattes. Again, this is with the desire to recreate the coffee shop experience without extra effort. On the final chapter of our feature on the Middle East, we talk about the future of coffee in the region. The Middle East is literally where coffee was discovered, and how coffee consumption as we know it, was born. Around the 11th Century, the coffee plant was discovered by a goat herder in Ethiopia, and knowledge about the energizing berries spread across the Arabian peninsula. And yet, today, the region remains one of the least known coffee markets in the world —surpassed by nearly every market in terms of actual consumption. But this is all beginning to change. The Middle East is seeing rapid growth in retail coffee sales, and together with Africa, is seen to become the fastest growing coffee region between 2013 and 2018. Coffee growth is everywhere in Dubai, and the rest of the Middle East. From the boom of coffee shops and chains in the city streets, to the noticeable increase of roast and ground coffees in groceries, there is no denying the permeation of coffee culture in this known tea-drinking region. There are numbers to back this up as well. More than 4,000 tea and coffee houses are operating in the region today, proving that coffee is more than just a beverage — it is a national pastime in its own right. 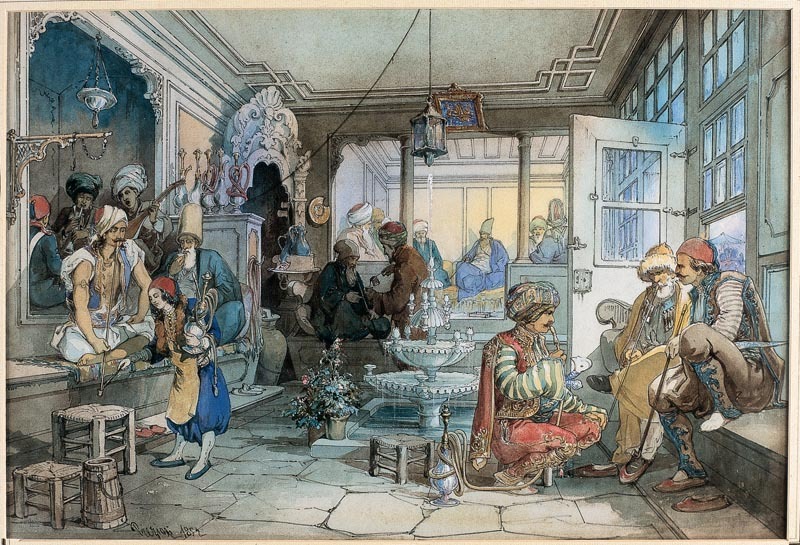 Coffee was then no longer just enjoyed at home, but also in the many public coffee houses (called qahveh khaneh), which began to appear in cities across the Near East. The popularity of the coffee houses then was unequaled and people frequented them for all kinds of social activity. Among the young Arab population however, “coffee culture” and overall consumption of the drink is gaining traction, as part of the increasing influence of Western culture. On our next post, we’ll tackle how young Arabians and Western influences are driving coffee growth in the region.